With Halloween just around the corner I thought it would be fun to feature some creative indoor and outdoor decorating ideas. A lot of people go all out with rolling heads and grave sites in their front lawns, but I am much more understated when it comes to Halloween. I prefer cute and creative ways of celebrating, with maybe a touch of darkness. Enjoy! 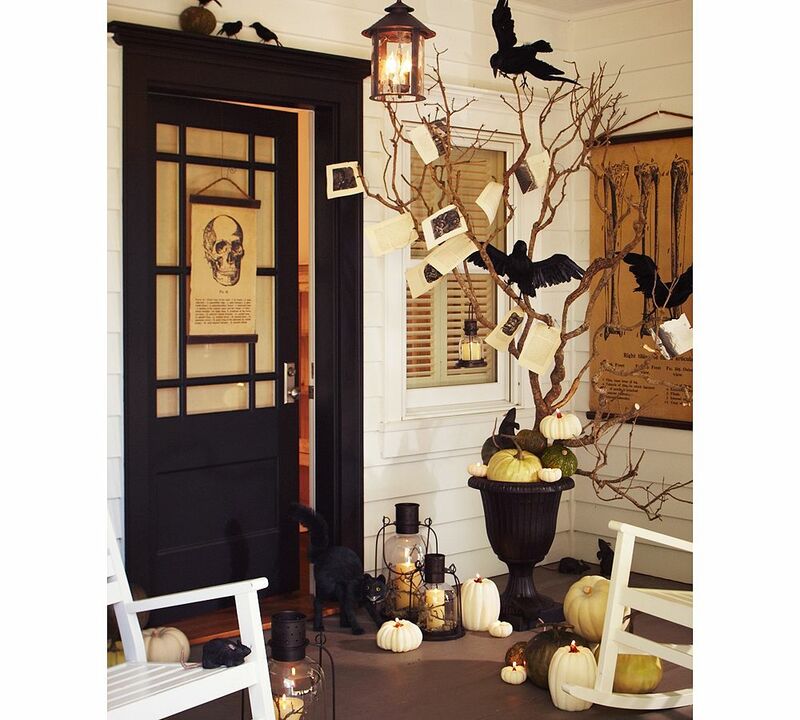 This one seems very cool, but where do you put that tree branch the rest of the year, not to mention fake crows? It may be a little time consuming cutting out all of those bats, but at least storage won't be an issue. My initial thoughts on the pumpkin bowl are all positive. 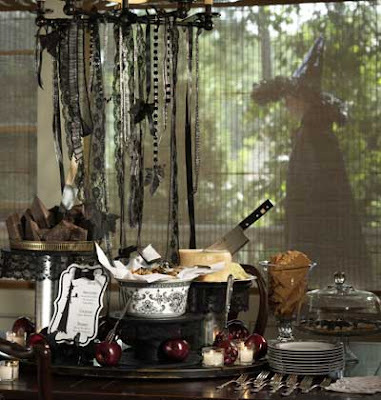 Great way to feature something on your table, colorful, festive, and creative. However, I am concerned with mess from the ice melting between the pumpkin and the bowl and the smell. Overall, I think I would still try it. 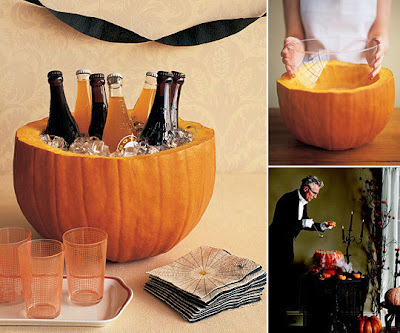 This is a really cute and inexpensive way to invigorate your space with some holiday spirit. Food, food, food! They made some really cool choices for their visual display, but I might be hesitant about eating a huge junk of chocolate (oink!) I love the apples as accents and the cheese with the knife. It would be a good idea to create some bite size things to have along side of this. Also, I recommend doing what they did with a tiered system. It's an old trade secret that everything looks better when it layered and at different heights. Nice use of the black lace too! The thing to remember here is black lace = creepy. It goths things up quickly and is pretty cheap at less than $5 a yard at most stores. 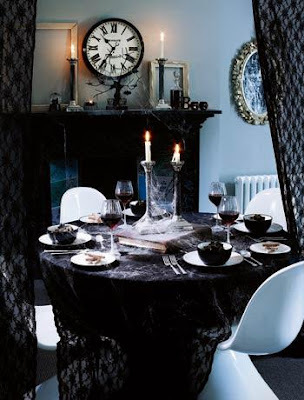 You could try picking up some mismatched silver candle sticks at a local thrift store to add some drama as well. 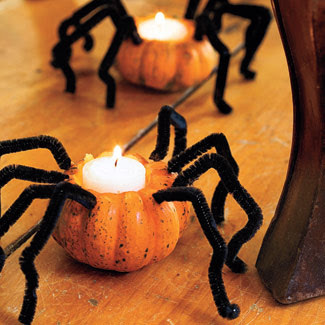 And of course, don't forget your fake cobwebs! 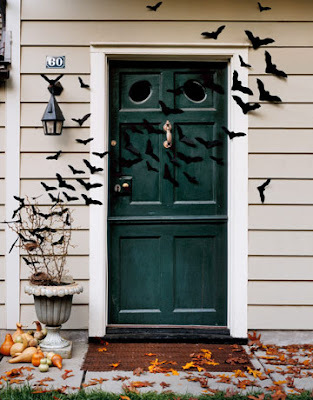 I love that idea of the birds all over the door. It is perfect fit for a costume I have been thinking about. Thanks! Thanks for the comment. Glad it gave you some inspiration! I think I've been thinking about the same costume. This one?